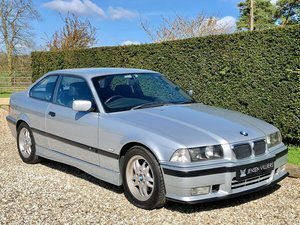 SOLD SOLD SIMILAR WANTED BMW E30 325i Motorsport One of 250 - Limited Edition Immaculate Sebring Grey & Unmarked Motorsport "Napatex" bubble leather interior Tech 2 bodykit. 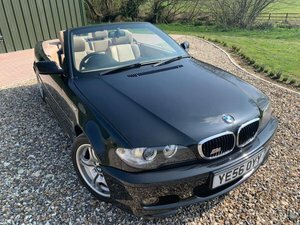 Optional Factory Vinyl hardtop (not pictured) £2000 - original factory issue (very rare) 104000 miles & comprehensive stamped service history This car has been extensively restored, and has had the benefit of a full bare metal respray in the original factory Sebring Grey metallic. No stonechips or rust anywhere. The body work is immaculate. All four wheels have been refurbished in the original "nogaro silver" finish and have brand new tyres all round. It has been fitted with a brand new black hood, and a new plastic rear window. As new condition. The interior is in very good condition, and the bubble leather free from excessive wear or tears. Certainly no rips or holes. It is fitted with a very expensive and rare "period correct" Blaupunkt Bremen SQR 49 head unit and Blaupunkt Gooseneck BEQ-S2 graphic equaliser. 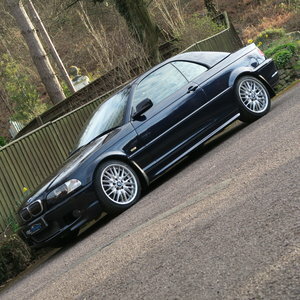 "The 325i Motorsport was a limited production based on the 325i Convertible. 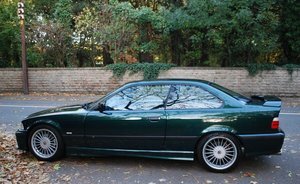 The Motorsport kept all the standard 325i running gear and just had the addition of M-Tech sports suspension as found on the 325i Sport. The addition of an LSD was an optional extra on the Motorsport unlike the Sport. The Motorsport was offered with the choice of manual or automatic gearboxes. 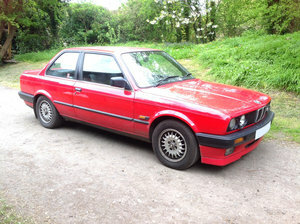 What makes the Motorsport unique to the rest of the E30 range is the paint colours and interior trim it came with. The Motorsport was the only E30 available with what is known as bubble leather (depending on the year), but also came with leather stitched doorcards and centre consoles. This vehicle is one of 250 originally produced in Sebring Grey and Macau Blue for the 1990 model year". These are very rare drivers cars, are not only fantastic cars to own, but also exceptional in terms of investment. As anyone in the know will agree, values of limited edition E30s and M3s have grown exponentially and show no signs of slowing. Viewing available by Appointment.